Apols for my ancientness re coax. We have here an olde worlde terrestrial TV aerial feed. Got a second coax socket alongside that for a satellite dish (if). This BT home mesh sounds like they can at least do something right. @lower: what's the cost outlay upfront/on-going? Also sounds like Sky might be worth me considering when they give an internet only option. I know it's Cat6 cable coz it's written on it! Are you still speaking to your sparks? Presumably he has/had a good idea of your requirements vis-a-vis smart TVs, Sky and the internet. First off I would ask him how he planned for your needs to be met by his first fix coax and cat 6 cable runs - can he give you a diagram - and what devices he had in mind e.g. TV coax signal splitter/amplifier. Are you sure all the coax cables go to the cupboard or is there one coiled up in a loft space ready for a specialist aerial man to fit a TV terrestrial aerial or satellite dish? You will of course need mains power in the cupboard for your router. edit: Your house being big, the 'furthest point' cat 6 may be intended for a wifi retransmitter, though in my experience one alone of the powerline variety still might not give you 100% coverage. See what performance /coverage you get with your (the ISP's provided) wifi router in your cupboard by the line entry box and go from there. Last edited by arsie; 09-28-2018 at 08:19 AM.
. @lower: what's the cost outlay upfront/on-going? £170 gets you a 3 disc system which i would have thought would be more than adequate for most houses and if not you can buy extra discs to extend the range. Our house is a rambling 1920's house with very thick walls and an unusual Z shaped footprint that means its quite a long way from the lounge at one end of the house where the virgin router is to the far end of the house. Getting wifi coverage was difficult before and we ended up with a few different wifi connections so that you could manually move to the strongest signal to avoid the device hanging on to a poor signal. The mesh system does away with that. You only have one wifi connection throughout the house and it does some clever 'beam steering' so that you are automatically connected to the disc with best signal. Our house sits on a 1/3 of an acre plot and we now have proper wifi coverage right out to the edges of the garden and beyond. I played around with Smart TV's and firesticks etc to avoid having to have a wired connection to the TV's but it was more hassle than its worth so ended up with one TV being fed by a virgin box for the channels that we pay for and the other 2 TV's are connected to Freesat boxes, fed by a satellite dish with a twin LNB which was much to install than a terrestrial digital aerial on a house like ours with a steeply pitched roof and very tall chimneys. We have wired ubiquiti wifi access points at in the offices at my factory. The mesh system gives better speeds and has proven to be as reliable. Architect will have all that stuff but I remember ruling out anything in the roof spaces. As I said, there is a cable between eaves and cupboard which is for a dish but I would be much happier with a streamed service sans dish. There is a map/plan somewhere so I will find out what wires lead where. There is power in the cupboard which houses the supply entry and fuseboard. The router and/or Sky box can run off that. Ok await diagrams but where there are double cat 6 / double coax electrical boxes suggests added devices/function not just a smart TV to watch. The person buying may be old school and want to use direct terrestrial TV or satellite. 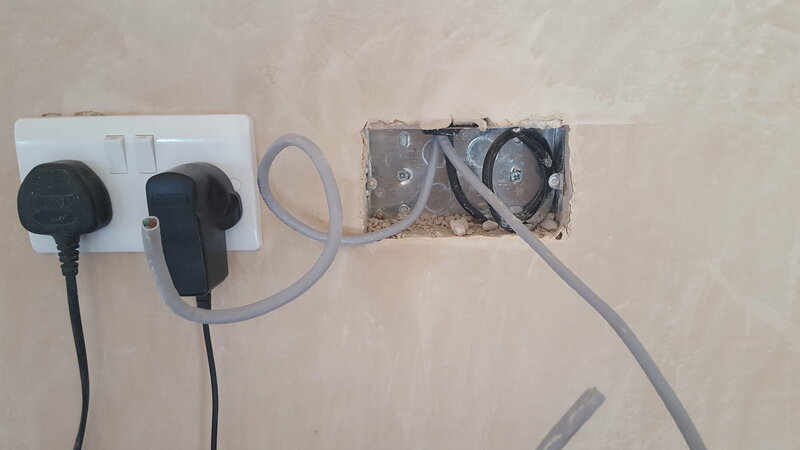 That is why your architect/sparks provided for coax. Although there is power in the cupboard is it ventilated? Dunno about Sky but my BT Youview TV box used to get quite hot. Also you will need to get command signals from the Sky remote control to the Sky box - magic eye or such. Last edited by arsie; 09-30-2018 at 02:00 AM. It's all unnecessarily complicated jargon based cobblers. Guessing you didn't fit 'smart' lighting controls then! Rako or Lutron etc? I don't see whats wrong with turning a light on when you enter a room and turning it off when you leave personally. Every time I get involved with such a system it's hassle. Normally some architect overcomplicating things as usual. Those that can afford these systems and the house to go with it are often older and get frustrated with the system pretty quickly when the techie has to keep revisiting to iron out niggles. That's before they have people house/babysitting that can't work out how to turn on the lights! What kind of sad feck needs to programme the timer and temperature for different times of the day months ahead? It has this remarkable ability to simply heat things up when it gets cold and switch off when they're warm!